When managing an ecommerce website, it is important to track essential metrics. 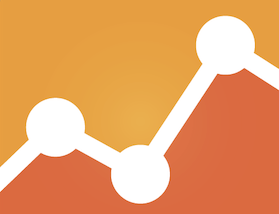 But there are so many metrics available in Google Analytics that it can be overwhelming. This article aims to help you decide which metrics will be most useful to you and your business for daily, weekly, and monthly tracking — to help you make smart, data-driven decisions. Transactions. Driving sales is the primary goal of an ecommerce website. Thus, looking at this metric on a daily basis is a must. 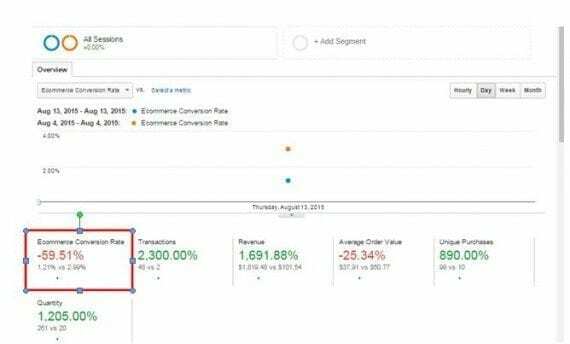 Keep an eye on day-over-day transactions in Google Analytics by going to Ecommerce > Overview. 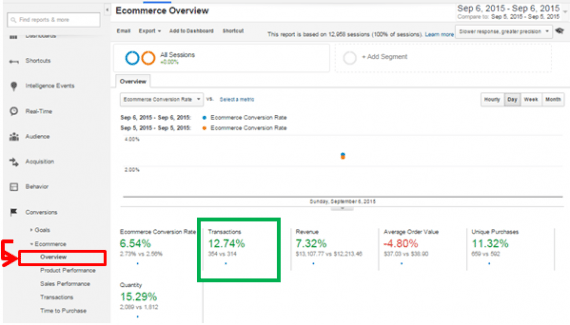 Monitor day-over-day transactions in Google Analytics by going to Ecommerce > Overview. You can also compare with the same day of the previous week. Monitor daily transactions versus the same day in the previous week. See at Ecommerce > Overview. This step gives you a sense of how your business is doing on a daily basis, and in what direction it’s heading. Revenue. Revenue is another metric to look at daily. It provides the monetary value in relation to the number of transactions. As with transactions, revenue can be traced in the Ecommerce > Overview report. Track revenue in the Ecommerce > Overview report. Conversion rate. It is important to also look at your store’s conversion rate daily — not so much to assess the campaign or website optimization, but simply to make sure that your website is running well, with no user experience issues. 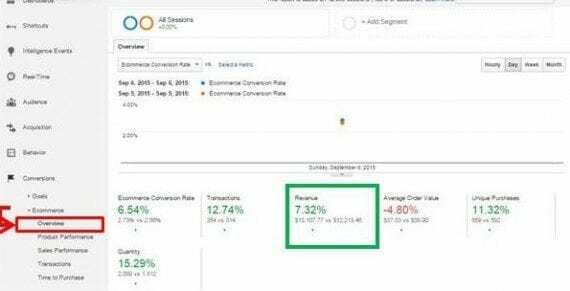 It is important to monitor your store’s conversion rate daily, at Conversions > Ecommerce > Overview. 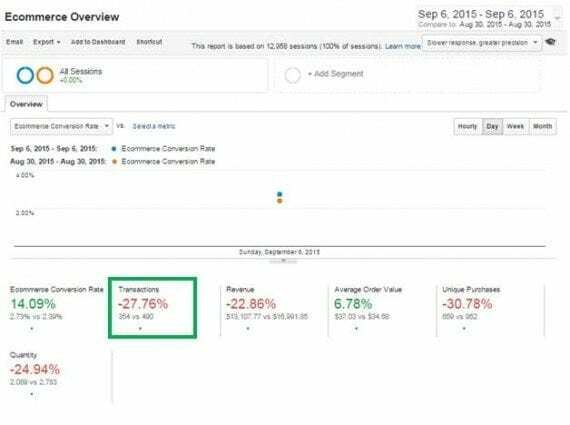 The screenshot above shows, a 59.51 percent drop in conversion rate (as well as a change in other ecommerce metrics). This signals that something has changed and should be investigated. It is also a good idea to look at performance of the main media channels each day, to make sure that they are all driving consistent revenue. Track daily performance of the main media channels, at Acquisition > All Traffic > Channels. If you discover that, for example, revenue from paid search has dropped significantly, it will be brought to your attention. Cost per acquisition. This is an essential metric to calculate and measure from two perspectives. Target CPA. What cost per acquisition can you afford, to allow your business to stay afloat? Actual CPA. What is your actual CPA after media traffic costs? Actual CPA can be calculated by dividing media cost by number of transactions, or can be accessed directly in Google Analytics, under Conversions > Attribution > ROI Analysis. 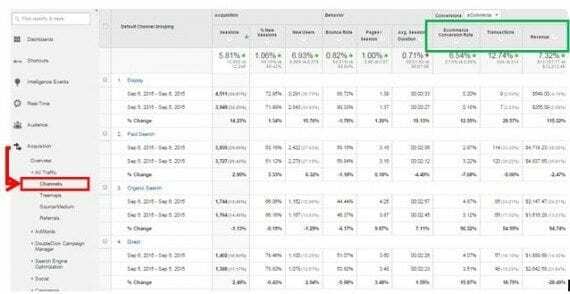 Review Actual CPA in Google Analytics under Conversions > Attribution > ROI Analysis. Transactions, revenue, conversion rate — metrics, above, to monitor daily — should also be analyzed each week. Transactions, revenue, conversion rate should be analyzed each week, as well as daily. Do this at Conversions > Ecommerce > Overview. Looking at a week’s worth of data is more significant; it allows for the making of informed optimization decisions. 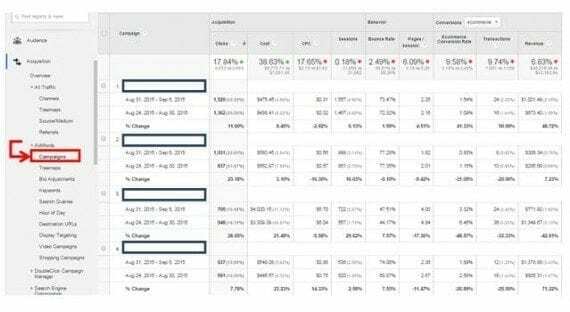 For example, when looking at week-over-week performance of the AdWords campaigns, you can select the campaigns that need to be watched and considered for optimization, if the decline in performance persists. 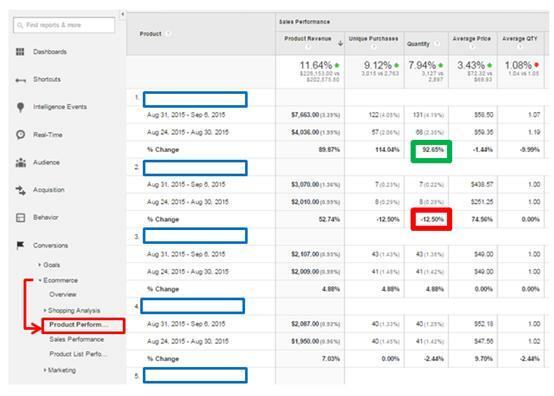 Looking at week-over-week performance of AdWords campaigns to identify campaigns that need to be watched and considered for optimization. 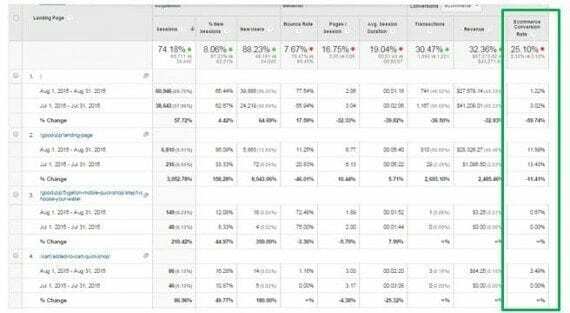 Access this report in Google Analytics at Acquisition > AdWords > Campaigns. Additional metrics to review each week are product revenue, product quantity, and cart-to-detail rate, as follows. Measures the performance of promotions. Product revenue is another important metric to look at, via Conversions > Ecommerce > Product Performance. The above screenshot shows two interesting insights. The first product was promoted in the week beginning August 31 by a 1.44 percent decrease in price, which led to an increase in product sales (revenue) of 89.87 percent. The second product was actually taken off promotion that same week — the price was increased by 74.56 percent. Even though the sold quantity decreased slightly, product revenue was up 52.74 percent. Product quantity. This metric has a close connection with the product revenue metric, which depends on how many products are sold. Keep track of this metric to assess your product sales, monitor your stocks, and measure the success of promotions and sales. Keep track of product quantity to assess your product sales, monitor your stocks, and measure the success of promotions and sales. See Conversions > Ecommerce > Product Performance. Cart-to-detail rate. 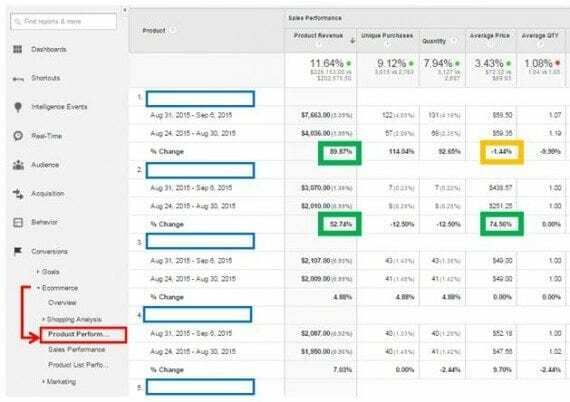 With Google Analytics’ Enhanced Ecommerce enabled and implemented on your site, additional product-related metrics can be looked at more closely. The cart-to-detail rate — the total added to carts of a given product divided by that product’s detail views — you can see what products are more likely to be added to the cart after users have read through the product details. This is a handy metric with which to experiment, to find out the effect of different product descriptions. Using the cart-to-detail rate — at Conversions > Ecommerce > Product Performance — you can see what products are more likely to be added to the cart after users have read through the product details. The buy-to-detail rate answers the question, “What products are shoppers most likely to purchase after looking at the product details?” Access this report at Conversions > Ecommerce > Product Performance. The same metrics that are monitored weekly, above, should also be tracked for month-over-month trends. These reports reveal more about the long-term movements. The data therefore has considerable statistical significance. 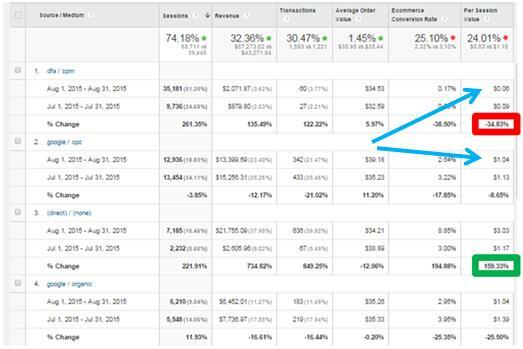 Additional metrics to look at each month are per-session value and conversion rate by landing page. Per-session value. This metric is especially useful when comparing performance by source or channel. It shows the revenue generate per user session. Per-session value shows the revenue generate per user session. View this report at Acquisition > All Traffic > Source/Medium. The above screenshot indicates the following. The per session value of Google AdWords CPC campaigns is much higher than display traffic (“dfa / cpm”): $1.04 vs. $0.06. Display traffic per-session value is down by 34.83 percent when compared to the previous month; for direct traffic it is up by 159.33 percent. Conversion rate by landing page. Landing pages are the most important pages on your website, yet marketers often struggle to understand their performance. 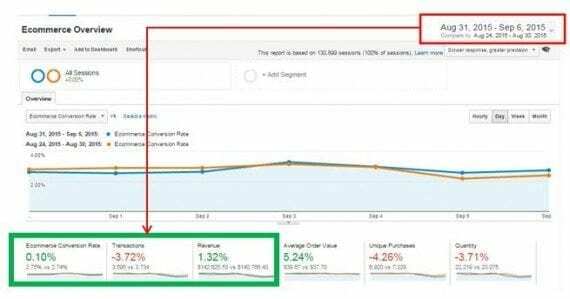 Use this metric to look at the conversion rate by landing page, as it shows how effective your landing pages are, what landing pages lead to conversions, and how their performance might change over time. Conversion rate by landing page shows how effective your landing pages are, what landing pages lead to conversions, and how their performance might change over time. 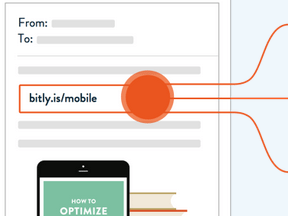 See at Behavior > Site Content > Landing Pages.